The ingredients that went into Origin's Big O monster are decidedly prime: six-core Xeon 5680 processor, overclocking up to 4.3GHz, crazy graphics power. And the cherry on top is an integrated, liquid-cooled Xbox 360 slim in every rig. That's nasty. The Big O has ferocious specs, but the real treat is that you can run the PC and the Xbox at the same time. Pretty special, and appropriately expensive; you're looking at $7669 for the base model, and for the pure hellbeast that is the Xeon 5680 model you'll pony up $17,000. Or all points in between; you can configure The Big O however you like. And personally, if I'm paying that much, I'd also like to be able to drive it to work. And if that doesn't do it for you, I don't know what will. 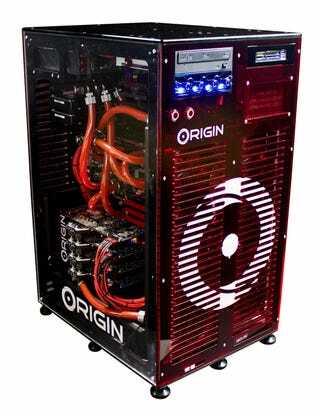 Miami, FL – September 7, 2010 – ORIGIN PC is proud to unveil The Big O, their latest creation designed for dominance and destined to make high performance computing enthusiasts and gamers to drool uncontrollably. The Big O fuses the capabilities of the fastest computing hardware on the market, ORIGIN's expert overclocking, and a built in Xbox 360 to create the ultimate gaming weapon. Absolute Power – With Intel's Xeon X5680 processors there is nothing you can throw at The Big O that will slow it down. Each X5680 features six-cores, twelve threads, supports ECC memory-and that's before we add a second CPU and overclock it to a lighting fast 4.3GHz. Add in up to 24GBs of Corsair GT 2000MHz memory and then dare any computer task to slow down your Big O.
Quad Damage – A strong core with excellent liquid cooling is the key to lasting performance and EVGA's GeForce® GTX 480 FTW graphics cards delivers the best graphical power money can buy. This power is multiplied in a SLI multi-GPU configuration creating the most immersive visuals imaginable in gaming and beyond. The Big O provides the unmatched graphics performance that will shatter any benchmark thrown at it. The X-Factor – To empower gamers with the most comprehensive gaming platform on the planet, ORIGIN integrates a liquid-cooled Xbox 360 slim directly into each Big O. Every Big O system is strategically modified so the Xbox ports are easily accessible with liquid cooled processors for extreme performance. You can even game on the Xbox 360 while your computer is busy dominating whatever other task it is assigned. Liquid Cooled to Perfection – ORIGIN keeps your Big O cool with its state of the art liquid cooling system that maximizes performance from the CPU, motherboard, graphics card and even the integrated Xbox 360 slim. The ORIGIN custom liquid cooling system aggressively dissipates heat and eliminates fan noise ensuring your system remains cool and whisper quiet.